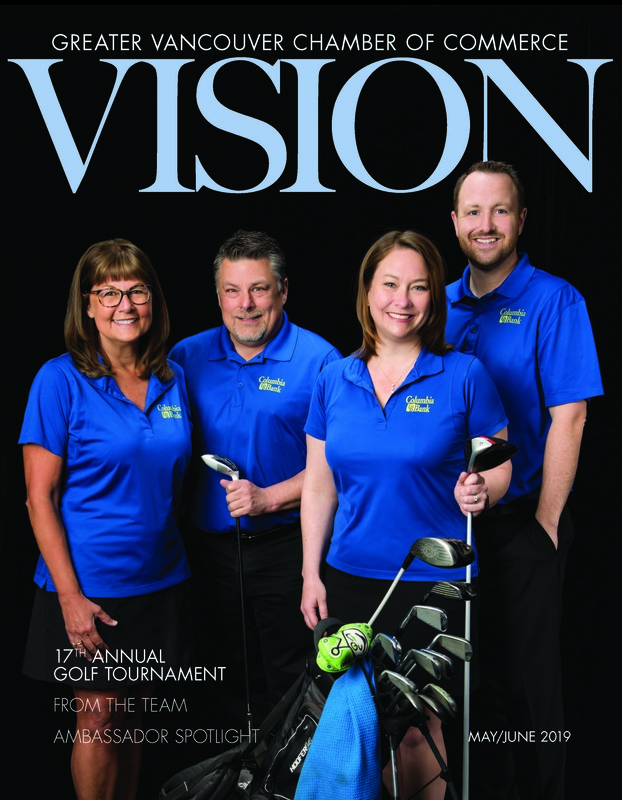 Welcome to the home of GVCC's Vancouver VISION Magazine - the digital edition. This is the bi-monthly publication of the Greater Vancouver Chamber of Commerce. This publication promotes business news and features themes in each edition. 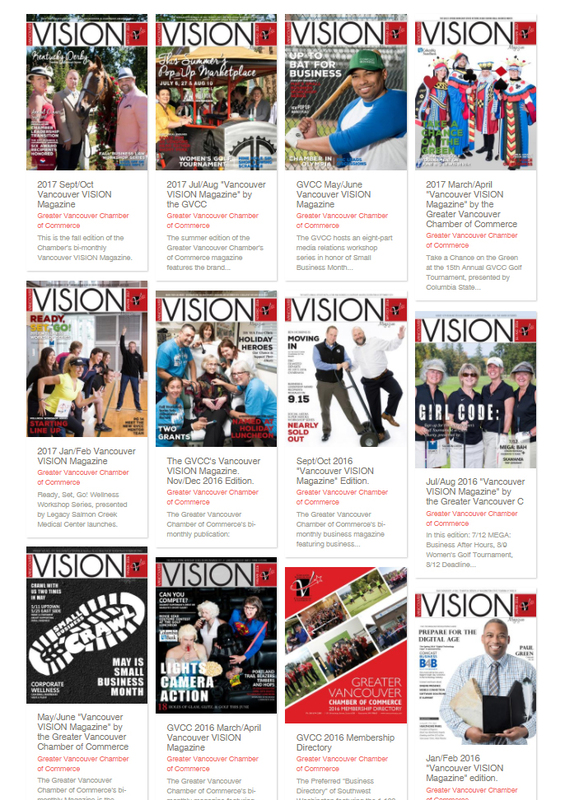 The Vancouver VISION Magazine also comes in hard-copy, distributed to the membership base and a number of distribution points throughout the community at large. Check out the most recent editions, now with a new look! VISION boasts opportunities for high-visibility at a low cost rate. Opportunities include 1/3 page, 1/2 page, or even a full page advertisement putting the spotlight on your organization. For more information about marketing opportunities in VISION, and within the Chamber, please see our 2019 Media Kit. Featuring: Columbia Bank on the cover, the Presenting Sponsors of the 17th Annual Golf Tournament "May The Course Be With You." Inside, features Business of the Week spotlights, an ambassador focus, Ribbon Cuttings, announcements From The Team, and a closer look at nConnect and WorkSource. 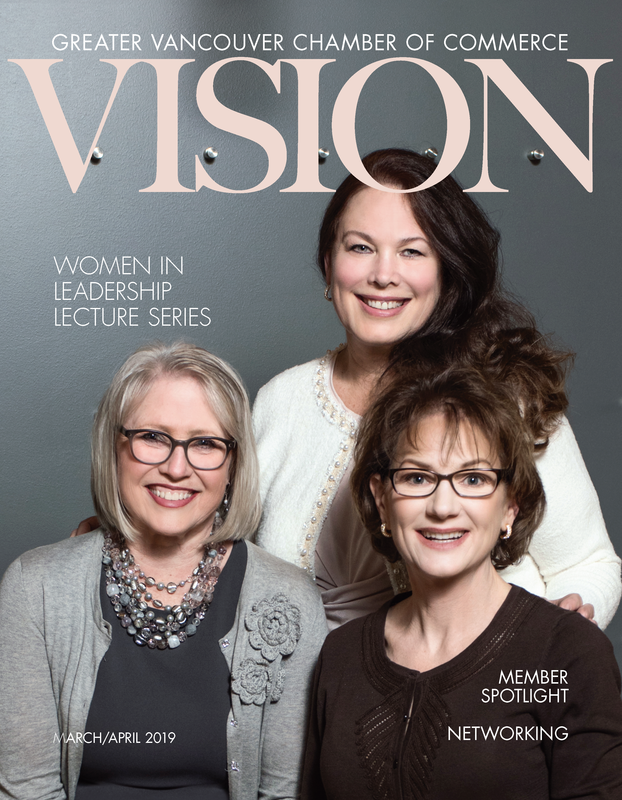 Featuring: Lee Rafferty, Colleen Boccia, and Cindy Horenstein of GVCC's Women in Leadership Lecture Series program. Inside, features Business of the Week spotlights, an ambassador focus, Ribbon Cuttings, event announcements, marketing opportunities, new members, and much more.